All around the world, millions of people are on highly restrictive lose-weight-quick schemes to improve their health. These diets are just one of many nutrition mistakes people make. Most of them fail, and the reason why is simple; they are not satiating. Generally speaking, any diet that fails to promote satiety is a diet that encourages food cravings. Satiety is the key to dietary success and sustainable, long-term weight loss. Despite this, it is barely mentioned by diet proponents. This article will explain why feeling satiated is so important, how we can increase satiety and the foods that help us to do so. Put simply; we can define satiety as the feeling of being satisfied with the food we have eaten. A sense of fullness without experiencing cravings for more food. Different macronutrients—and even different foods—all have very diverse effects on this sense of satisfaction. Protein is by far the most satiating macronutrient, followed by carbohydrate and fat – the order of which many people fail to agree on (1). Low-carb, high-fat diets appear to improve satiety levels more than high-carb, low-fat diets do (2). However, clarifying the type of carbohydrate is important; fiber closely follows protein for its satiating ability. In other words; sugars and refined carbohydrate are quite different from fiber-dense vegetables. Key Point: Satiety is a feeling of fullness when we have eaten enough food. Feeling satiated is important to avoid excessive food intake. Read the newspapers each day, and you’re sure to come across an article querying the reasons why people get fat. It’s my belief that the answer to this question is much more straightforward than most people believe. We are simply eating the wrong foods – and far too many of them. It’s also no surprise that we are overindulging, as the food most people are eating is ultra-processed and lacking in nutrients. If we don’t give our body the nutrients it needs, then we’re always going to be hungry. Rather than the never-ending focus on consuming fewer calories, it would be much more beneficial to concentrate on increasing satiation. Key Point: Satiety is important for sticking to a healthy way of eating and, by association, for our overall health. Why is Feeling Satiated Important? Much of the world—especially Western Countries—is in the midst of an obesity and diabetes crisis. Worldwide obesity rates more than doubled between 1980 and 2014, and over 39% of the world’s adult population is obese (3). Despite the common media message, “moving more and eating less” isn’t the solution to this problem. For one thing, moving more and eating less is so much easier for some people than it is for others. Unfortunately, a lot of people do want to lose weight, but they can’t manage to eat less. The reason for this is that they experience constant food cravings due to the influence of hunger hormones like ghrelin (4). In the modern world, continuous snacking throughout the day and binging on ultra-processed food is a social norm. After all, estimates state that ultra-processed foods contribute 60% of the calories in the average American diet (5). These foods are virtually devoid of nutritional value, and they not at all satiating. Key Point: The go-to weight loss method for many dieters and nutritional professionals is to cut calories. However, if a diet plan doesn’t support satiety, reducing calories is incredibly difficult. Perhaps one of the biggest problems is that far too many people are eating for pleasure rather than eating for nutrition. Despite being full, many people experience constant cravings for food simply because they enjoy eating. The result is that they never feel satisfied, even immediately after consuming a large meal. To put it another way, they have a full stomach but a hungry brain. Many people like to call this “greed,” but the real reason for this is hormones. In fact, there are several hormones which have a link to levels of satiety. These include cortisol, leptin, and ghrelin. 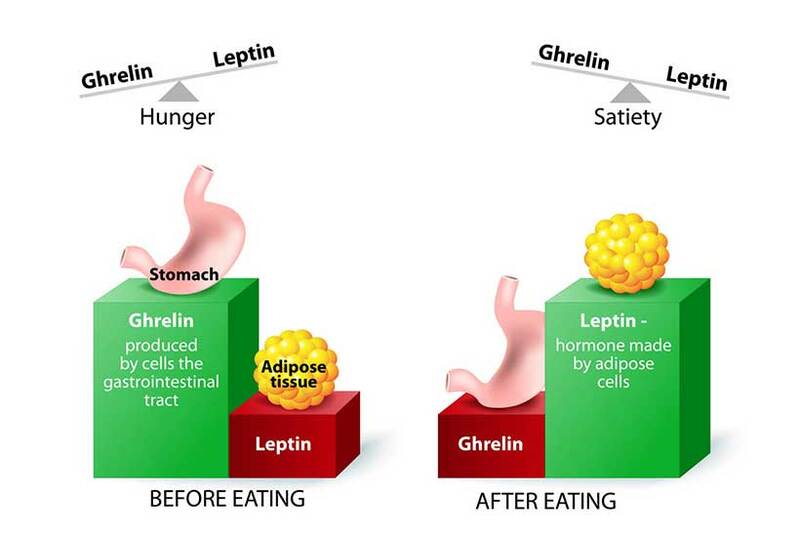 The two hormones leptin and ghrelin play a significant role in appetite regulation. Leptin is a satiety hormone – meaning that it decreases hunger, and ghrelin is a “hunger hormone” which increases appetite (6, 7). To regulate food intake, leptin relays a message to the hypothalamus region in the brain, basically telling us to stop eating (8). The human body is intelligent, and leptin secretion increases as our body fat goes up. The reason for this is because it is our adipose (fat) cells that produce leptin. This process is a smart, health-protective system; gain fat, and more leptin encourages you not to eat. In contrast, when someone becomes very skinny, they will feel much hungrier. However, the problem occurs when people become leptin resistant. Key Point: Leptin makes us feel full, while ghrelin stimulates hunger. Both of these hormones play a significant role concerning satiation. Coming back to that “eat less and move more” advice, the reason why obesity rates are rising isn’t that people are lazy. It’s because they can’t control how much they eat. To blame this on a lack of self-control is both insulting and incorrect; many people do all they can to resist snacking. 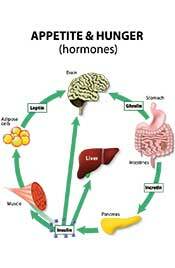 Leptin resistance plays a vital role in food cravings and therefore obesity. In this situation, the brain becomes unresponsive to the effects of leptin, and there is no suppression of appetite (9). As a result, even though we are eating and gaining more weight, leptin has no impact, and we never feel satiated. Various theories exist on what causes leptin resistance and they include inflammation and obesity (10, 11, 12). Overall, leptin resistance is a complex hormonal problem that is likely multifactorial in causation. Key Point: Leptin resistance can occur due to hormonal issues, often resulting from excessive weight/obesity. It is strongly related to overeating. One of the biggest keys to satiation is to eat wholesome “real” food. By this, I mean foods which grow/exist naturally and don’t rely on heavy industrial processing. Despite the misguided—but technically correct—view that all calories are equal, different foods have varying effects on the body. For example, 400 calories of liver will provide almost every nutrient in the book, and a significant amount of satiating protein. On the other hand, 400 calories of soda will lead to a huge spike in blood sugar levels and provide no beneficial nutrients. Rather than leave you satiated, the latter will quickly have you craving more food/sugar. In this sense, all calories are far from equal – especially regarding the impact they have on satiety. Key Point: One of the quickest ways to improve satiety is by ditching industrially refined foods. They are lacking in essential nutrients, and leave us feeling hungry for more food. If you never feel full, it’s highly likely that you’re eating the wrong foods. Unlike fresh and unprocessed whole foods, ‘ultra-processed’ foods are poor-quality industrial formulations of ingredients derived from food. Studies show that the degree of food processing is a large factor in how satiating food is. In a French study of 6686 elderly people, the satiety potential of food had a strong correlation to the level of processing. The more processed each food was, the less satiated the participants were (13). Further, porridge oats have a much greater impact on satiety than ready-to-eat breakfast cereal. However, a breakfast of two eggs is a lot more satiating than oats (14, 15). 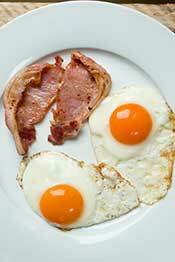 A randomized controlled trial also shows that a high protein breakfast (sausage and eggs) leaves participants more satiated than a low-protein control or no breakfast (16). Key Point: Eating but never feeling full is a problem, and something which refined foods negatively contribute to. A protein-rich breakfast is the best way to start the day to achieve no feelings of hunger. How Can We Increase Satiety? Ensuring adequate intake of protein: protein is essential for satiety; it holds off hunger better than any other macronutrient, and protein-rich foods are highly satiating. Focus on nutrient-dense whole foods: the more nutrient-dense (and less energy-dense) foods are, the better. Drink enough liquid: this stops us from confusing hunger with thirst signals. Choose fiber-rich carbohydrate: if you eat carbs, focus on fibrous sources such as vegetables and whole fruit (berries are great). As well as containing fibrous carbohydrate, these foods also contain large amounts of water, which both help with satiety (17, 18). Opt for healthy sources of fat: meat, fish, and plant sources of fat are all incredibly nutritious and filling. Some excellent examples include salmon, steak, and avocados; rich in protein, vitamins, minerals and they’re also hydrating. Eat slowly: quicker eating has links to a much higher intake of food. This correlation could be due to finishing meals sooner than it takes for satiety cues to reach the brain, as well as “mindless eating.” This term refers to our behavior when we don’t realize how much we’re consuming (19). Use Vinegar: Various studies show that vinegar lowers glucose and insulin responses to a meal, and leads to higher satiety. The foods above all satiate and help keep us feeling full. In addition to these points, it’s also important to limit sugars and refined sources of carbohydrate. These ingredients tend to appear in highly processed products, and they negatively impact appetite-related hormones such as insulin (20, 21). Key Point: Focusing on the foods which provide the highest level of satiety and avoiding highly processed carbs should be the first step to control appetite. There are some foods, drinks, and food-derived supplements that may have appetite control benefits. However, for 10 simple satiating food choices, here are 10 of the most filling foods in the world. The list covers meat, poultry, seafood, and vegetables. Including one or more of these foods in your meals will help you with feeling satiated. Beef contains numerous essential minerals including zinc, iron, selenium, and magnesium. It’s also very high in protein, providing 25.1g protein per 100g (22). With this impressive nutrient density and protein content, beef certainly helps fill you up. Despite the occasional negative stories in the media, the evidence of beef causing harm is minimal. Chicken is one of the best foods for satiety due to its impressive protein density. While it isn’t as nutritious as beef (or red meat in general), it still contains a decent selection of vitamins and minerals. Notable nutrients in chicken include B vitamins, phosphorus, and selenium. Chicken breasts contain an enormous amount of protein, with 100g providing 31g protein (23). Better yet, chicken drumsticks are full of protein and fat – great for satiety and much tastier too. Similar to chicken breast, lean white fish is one of the richest sources of protein. Despite 100g of cod only providing 105 calories, there is an impressive 23g of protein (24). Also, there is a myth that white fish like cod and haddock don’t contain omega-3 – but they do. While it isn’t as much as oily fish like salmon, sardines or tuna, 100g of cod still provides 172 mg omega-3. Cod also offers an excellent source of phosphorus, magnesium, selenium, and B vitamins. All in all, cod is a protein-rich food that is extremely filling. Tip: it tastes great with some hot coconut cream mixed with lemon juice and parsley. I like to call eggs “nature’s multivitamin” since they are loaded with essential vitamins and minerals. They are also incredibly beneficial in helping us stave off hunger, with studies showing that eggs are the best breakfast for satiety. In fact, eggs provide a good source of virtually every nutrient except vitamins C and K.
With one egg containing 6.3g of protein, this soon adds up when a meal includes three or four (25). In short, eggs are one of the most satiating foods on the planet. Green veggies such as asparagus, broccoli, and spinach are extremely nutrient-dense, full of fibrous carbohydrate, and they even contain a little protein too. Compared to digestible sources of carbs such as white rice, bread, and sugars, they have the exact opposite effect on keeping us satiated. Looking specifically at spinach, 100g comes in at a minuscule 23 calories – but these calories are packed with nutrients. In particular, there are massive amounts of vitamins A, C, K1, and B vitamins, as well as 3g of protein (26). All in all, these vegetables are highly satiating, and they provide some nice decoration next to a tasty steak. Making a traditional meat stew keeps us feeling full better than just eating a piece of meat alone. The reason for this is twofold; first, a stew contains a significant amount of fluid. Studies show that compared to solid foods, soups induce a greater feeling of satiation due to delayed gastric emptying (emptying of food from the stomach) (27, 28). Secondly, soups include a greater variety of meat and vegetables, helping to increase the nutritional value of the meal. Quark is a dairy product that contains a substantial amount of protein; per 100g there are only 77 calories but 14.1 grams of protein (29). As a result of the protein density, quark is one of the best foods for satiation. While cod provides a decent amount of protein and a small presence of omega-3, salmon offers both of these nutrients in abundance. This oily fish offers around 2600mg of omega-3 and 25g protein per 100g. In the same fashion as eggs, salmon contains virtually every vitamin and mineral too. Rich in both energy and nutrients, salmon will certainly leave you feeling satiated. Almost all shellfish are nutritionally impressive, and shrimp is no exception. Crammed with beneficial vitamins, minerals, and omega-3, they are also very high in protein. Despite 100g coming in at only 99 calories, it has 21 grams of protein (30). Fry them up in a bit of butter for a delicious and satiating meal that helps kill hunger. Milk is a complete source of food which contains carbohydrate, protein, and fat. As a result, we should be careful with the amount we drink since it’s so energy-rich. One cup of whole milk contains a decent amount of protein, and it’s reasonably nutrient-dense. Furthermore, several recent studies show that whole milk is significantly better for satiety than low-fat milk. Notably, studies also show that low-fat milk raises the risk for central obesity while whole milk has the opposite effect (31, 32). Key Point: These foods on this list are all nutritionally dense and rich in protein. As a result, including them as a regular part of the diet helps to improve levels of satiety. To sum up, losing weight is not easy, and a successful diet takes time. However, feeling satiated is arguably the most important factor in maintaining a successful diet. Without satiety, food cravings can take control, and willpower can only endure so much against powerful biological urges to eat more. Focusing predominantly on whole foods and including a quality source of protein at each meal can make all the difference. Joseph,nice article.Very clearly described the relation between ghrelin and leptin.Pictorial methods are very effective.Also key points are very catchy.